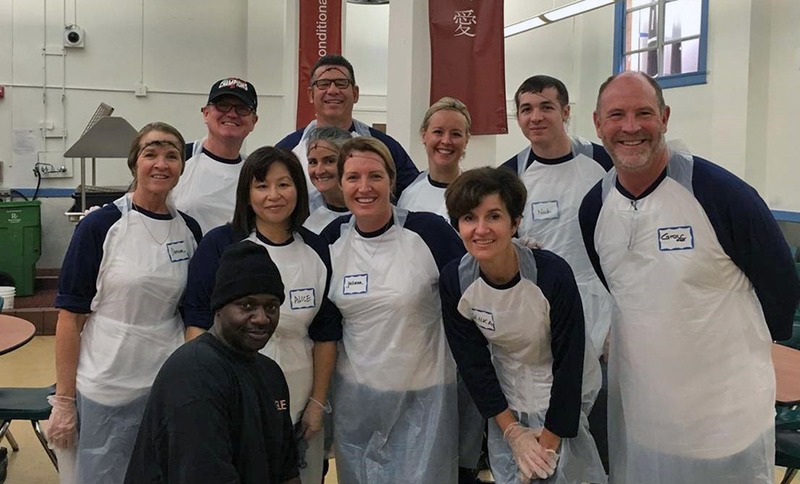 At the end of September, over a dozen Signature Homes’ associates dedicated their time to serving food at the GLIDE Foundation in San Francisco. GLIDE’s program is the only one in San Francisco to provide 3 nutritious meals a day, 364 days a year, to the city’s poor, homeless and hungry. Staff from Signature rolled up their sleeves and served lunch to around 800-1,000 people in the city during their visit. The Volunteer Resource Program at GLIDE places about 10,000 volunteers each year, totaling 65,000 hours of service. Serving a meal in the Daily Free Meals Program is a transformative experience. This program requires 85 volunteers each day to fill the breakfast, prep, lunch and dinner shifts, 364 days a year. Volunteers assist with serving food, bussing tables and handing out silverware and condiments. GLIDE is a place where old, destructive ways of being are thrown out and new ones created. Where names are named and love is celebrated and a simple call goes out to all races, classes, genders, ages, and sexual orientations: It’s recovery time. By serving meals, offering healthcare, educating on violence, and collecting donations, GLIDE is here to help create a foundation of happiness for all. If you would like to volunteer to serve a meal at GLIDE or have any questions, please feel free to contact the volunteer team at volteam@glide.org or visit their website for more information. Not interested in serving a meal? Become a volunteer in one of GLIDE’s many programs! Work with children, get involved in the health center, connect with the women’s group, help the fundraising office, exercise your green thumb in the rooftop garden and more. For more information click here. Be prepared to have your heart filled with warm memories and make some beautiful human connections!